Violeiro playing, by Almeida Júnior. The viola caipira is a Brazilian folk instrument. A folk instrument is a musical instrument that developed among common people and usually does not have a known inventor. It can be made from wood, metal or other material. Such an instrument is played in performances of folk music. The instruments can be percussion instruments, or different types of flutes or trumpets, or string instruments that are plucked, hammered or use a form of bow. 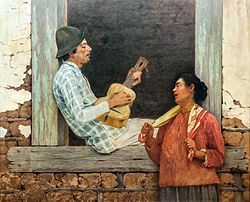 Some instruments are referred to as folk instruments because they commonly appear in folk music, even though they do not meet the criteria defining a folk instrument; an example is the harmonica.